Two shot extension tubes are added along with their fully machined sights. They feature fully adjustable ghost ring apertures that are adjustable for elevation and windage. Front and rear sights are fully shrouded for protection against being knocked out of adjustment or damaged if dropped. Every Nighthawk shotgun is finished with CeraKote. Finishes differ from all black to full custom. The six round side shell carrier and fast action tactical safety are the final standard components on every shotgun Nighthawk builds. The shell carrier is made from a one-piece aluminum billet that is hard anodized to military specifications and the dome on the safety is so pronounced that you can release the safety while acquiring the trigger in the same move. 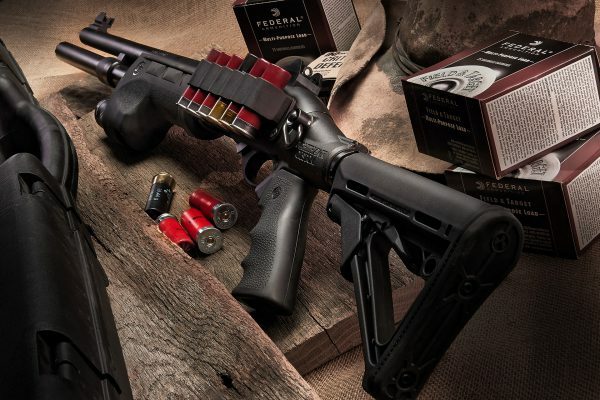 Nighthawk can provide you with a complete custom shotgun package that has proven itself to be the most intimidating, effective and versatile of any weapon deployed in an urban environment. The Overseer shotgun line starts at $1,525.00. More details on the Overseer line can be found here. This entry was posted in Shotguns and tagged Nighthawk Customs, Remington. Bookmark the permalink.